Locally owned & operated Fully Promoted Morphett Vale is proud to be a part of the national (indeed global) network of Fully Promoted stores. Our motto at Fully Promoted Morphett Vale is "No job is too big, and equally no job is too small" !! We believe our commitment to customer service is what will stand us apart from the competition and we welcome the opportunity to demonstrate that. 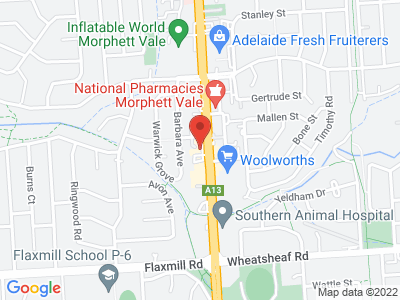 Situated right in the heart of Morphett Vale, and with ample off street parking, we are ideally located at 161 Main South Road. If it isn’t convenient, and/or practical, for you to come to us then we will come to your workplace and work with you and your team on how we can best support your marketing and promotional plans. It might say on the door that our opening hours are Monday-Friday, 8.30am - 5.30pm, but in reality we are open when it best suits you and we will work in with your schedule. We offer a wide range of products and services that extend from uniform supply and decoration right through to personalised gifts ideal for recognising those important milestones and achievements. Your Brand is your Business and we want to help you achieve high levels of awareness for your Business through impactful, high quality and long lasting brand solutions. We are proud to be part of the small business community in the Southern suburbs and the broader Fleurieu Peninsula and we look forward to working with you at some point in the future. Michael, Anita & the team are very friendly, helpful, and deliver a great result at good prices. Our team is very happy wih their new uniforms. Good local business that is very keen to help us make a good impression.